Wow! Last night's brick training was great. Quite honestly when I got in the car at 5pm and it still read 100 on my car's thermometer, I was less than happy to go. When I got there I just couldn't bring myself to do the same small loop 5 or 6 times, so I did two bigger loops around NASA. That was much better. The first loop I took at a decent pace, but then two faster riders from my club caught me at the beginning of the 2nd loop. So I decided I would try to keep up with them. I managed to stay within 30 to 40 yards of them the entire way. It's not like I was right on top of them, but at least I didn't see them taking off into the sunset! My run was good too! I was supposed to do a negative split run by 2 minutes. I've done it once, but generally missing by 15 to 30 seconds. Last night I did my run with a 2:22 negative split -- and felt really good, walking very little. Oh! 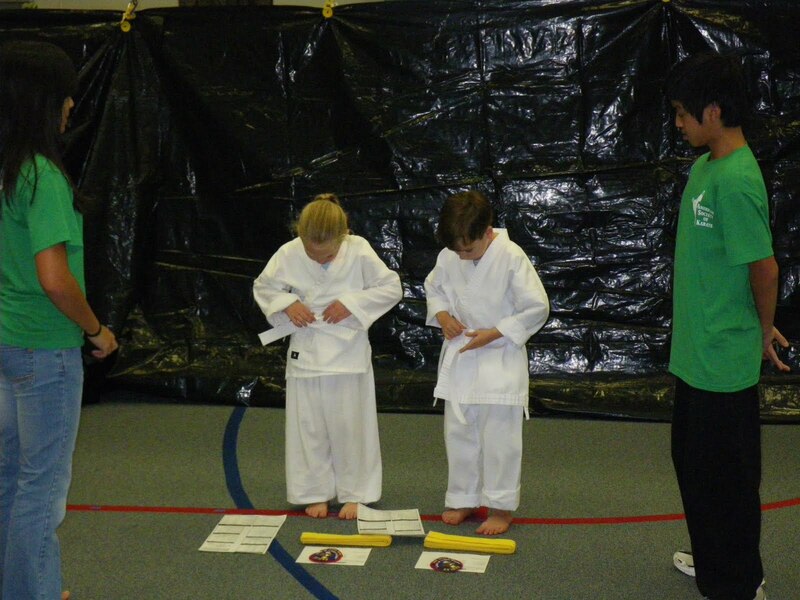 And my "Kinder Ninja" earned her Yellow Belt last night! Cassie is on the left. 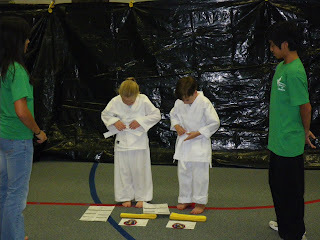 Cassie and her Classmate receiving their Yellow Belts. 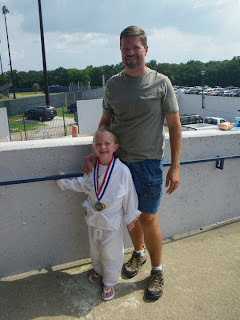 Daddy and Cassie after her Spar Match; Cassie won her match!